Cisco Jabber is a pretty good IM application. I’ve seen how it is a true productivity enhancer. But not so much when it doesn’t work right. I hadn’t rebooted for awhile. I had a bunch of open conversations. Then all of a sudden, I could no longer send additional Jabbers (IMs, messages, or whatever you call them). I would type my message, hit ENTER (<CR>), and that action would just give send the cursor to the beginnning of a new line below the one I typed in my message box, like a typewriter. I soon realized that I had no way to SEND what I was typing because you use ENTER to do that! A quick Internet search revaled nothing (hence this article). So I restarted Jabber and that got things working again, but of course I lost all my conversations. Being a security-minded person I kept clicking No to this pop-up. Then I noticed the correlation. As soon a I clicked No on that pop-up, my ‘s began to work as expecetd. After a few minutes they stop working again, I hunt for the pop-up, and click No again. And it goes on like this all day. Jabber has a main narrow window which cpontains all the contacts and other links, and the conversation window. Highlight the main narrow wnidow and the pop-up will appear (if therer is one). Otherwise it can be hard to find. Why is there a security alert? Being a srot of certificate expert, I felt obliged to delve into the certificate itself to help whoever may try to solve this. 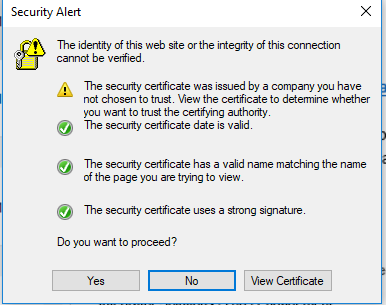 I captured the certificate and found that it is a self-signed certificate! No wonder it’s not accepted. So our Unified Communications vendor, in their infinite wisdom, used self-signed certificates for some of this infrastructure. Bad idea. I suppose I could accept it, but I’d prefer they fix this. I don’t want end users becoming comfortable overriding security pop-ups. The sudden inability to use ENTER within Cisco Jabber is explained and a corrective action is outlined. This entry was posted in Web Site Technologies and tagged Cisco Jabber. Bookmark the permalink. I had the same issue, turned out the dialog in the main Jabber window was about a script running that could cause my browser to run slowly (a familiar one on web browsers). Once I clicked No the enter key worked again.